When it comes to pregnancy, the majority of the nine-month journey focuses on the soon-to-be mother. While mom undergoes the physical load of growing a human being inside her, the soon-to-be dad undergoes his own adventure. Fatherhood can be a scary journey, especially if you’ve never taken it before. From the anticipation and often times anxiety of becoming a parent, to the emotional ride of watching your partner withstand the ups and downs associated with pregnancy, there’s a lot on his plate. The good news is that having the right tools can prepare you both physically and mentally for your newest adventure. As you watch mom undergo her pregnancy changes over the course of nine months, there are many ways you can be actively involved, the biggest aspect of which is taking on the physical roles that mom may not feel up to. There’s also a number of ways you can prepare for your new family member’s arrival. Before you welcome your little bundle of joy, be sure to stock up on a few baby essentials to help prepare and feel at ease and included in the process. 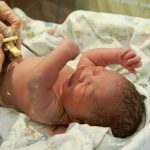 As much as you’ll marvel at the sensation of holding your newborn in your arms for the first time, the fun will definitely wear off after a few months. Invest in a baby carrier for the days when you need to cook, clean or shop with two free hands. Everyone knows that babies need bottles, but were you aware that bottle accessories are just as important? A bottle brush, for example, will keep you from having to add your baby’s bottle to your general dishwater, thus, no food particles will end up clinging to its interior. Mom may already have one, but if it’s too big, gaudy or girly for your tastes, you might want to purchase one of your own. 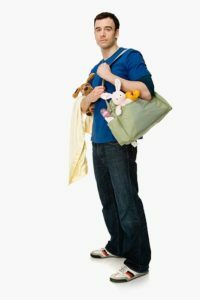 If you don’t feel comfortable with your diaper bag, you’ll be much more likely to leave it at home and not have it when you need it. Once they’re out of the oven, you’ll want to show off your little bun to the entire bakery. Just make sure that you buy a functional stroller over a flashy one. Prioritize safety and security more than bells and whistles. Once your little one arrives, you’ll quickly learn that regardless of how well you try to plan diaper changes before heading out of the house, you will inevitably need to find a diaper changing station while you are out. Invest in a mobile diaper caddy with diapers, cream, wipes and a changing pad. Newborns can’t be plopped in the bathtub with a rubber duck. They’ll need their own bath support structures made of soft, flexible plastic that can be arranged in sinks and tubs. You’ll especially appreciate their convenience after a long day of baby wrangling. It’s a common misconception that you only need to baby proof your home once your little one starts crawling. While you might not need to unfold baby gates until then, curious fingers and mouths can find trouble anywhere. Stocking up on corner huggers and electrical outlet covers can help prevent many accidents. 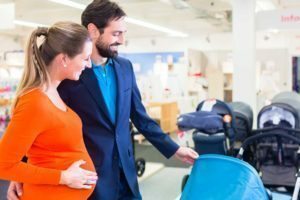 Finding the right car seat for your infant can be a long and arduous process, so it’s best to start before they’re even born. What brands are the most trusted? Which tests have the highest safety ratings? Which prices are within your budget? You’ll need a high chair sooner than you think. Newborns grow at a startling rate and their days of bottle-feeding in your arms are numbered. Buy a high chair today so that you’ll be prepared for tomorrow. Send your baby into the land of dreams and take a load off your own feet with the purchase of a good old-fashioned rocking chair. They’re also useful for sick and fussy babies who need motion to calm down. You might even catch a few Zzzs yourself if you play your cards right. Often time, parenting books can get the stigma of being a guide to tell you how to parent. However, this isn’t always the case. A number of books on the market cater specifically toward soon to be dads and offer insight and tips for the entire pregnancy process. Last but certainly not least, give yourself the indulgence of a steaming cup of coffee as soon as you wake up. You’re going to need it to survive a day of dirty diapers, weird rashes, misplaced toys and crayon drawings on the walls. Sure, mom needs a hospital bag, but you will need one, too. While you may not need to run right out and purchase a specific bag to take with to the hospital when the arrival day comes, as any bag will do, it is essential that you remember to pack a few key things. Fill it with gear like a razor, toothbrush, toothpaste, iPod or iPad, camera, extra batteries/chargers, magazines or books to read, you can even throw in a deck of cards to play with Mom during the down time in labor to help clear her mind. Dad will often be the one in charge of contacting friends and family with the big news of your little one’s arrival. Be sure you’ve prepared a list of key family and friends to contact once you are headed to the hospital to gather as a support team and also be sure to included out-of-towners to keep them updated on the news. Additionally, make sure you and your partner have decided on a game plan when it comes to social media postings and when the news will be digitally shared. While mom will be cutting out bad habits and loading up on a healthy diet, take the opportunity to do the same. Go into the nine-month adventure as a team and strive to become your healthiest self to help make mom’s cravings easier to overcome and give your baby a healthy environment to come home to. This may seem obvious, but be sure you know exactly where you need to be when arriving at the hospital. In addition, know a variety of routes to get to there in case you happen to not be at home when it’s time for baby’s arrival. These are just a few essentials on the dad-to-be shopping guide and preparation guide. At the end of the day, your tools matter less than your enthusiasm, so don’t stress too much over this purchase or that. As long as you remember to be supportive and present in the pregnancy and labor processes, everything else will fall into place.